If you know the history of drum machines, the first thing you want to do with the TR-8S is load up the 808 kick drum. It's a deep, satisfying boom that's been an important part of everything from hip-hop to rock. But after you get done having fun with four-on-the-floor bass hits, it's time to get to the real work -- your own rhythms. For that, it's tough to beat the latest digital percussion instrument from Roland for ease of use and features. The TR-8S takes what Roland learned from the TR-8 to build an amazing drum machine worthy of live musicians and producers. If the vast sound and kit library aren’t enough for you, you can add your own samples. Be the first to review the TR-8S? Based on the TR-8 (itself based on the legendary TR-808), the $699 TR-8S expands on the abilities of both of those drum machines, creating something that's more than just a grab for some nostalgia-based cash. It's a feature-filled addition that should be welcome in any percussion and production setup. With its extensive library of drum kits and sounds, a sampling feature and expanded programming controls, the latest Roland Rhythm Performer is better than the sum of all its parts. At first glance, it looks like its predecessors. But on the left and right side of the console are the new features that make the TR-8S shine. On the left are the eight sequence buttons available per pattern (a sequence is typically a 16-note drum part). That's six more than the machines that came before it, and it opens up a whole new world of pattern programming. While a sequence is playing, musicians can press any of the eight buttons (that are ordered A thru H) to make that selected part the next one in a pattern. This allows real-time selection of multiple beats in any order you want. Additionally, you can press multiple buttons at once and the instrument will play those sequences in alphabetical order. Building patterns on the TR line has always been easy and, with the addition of those the extra drum parts, I found playing live with the instrument to be more enjoyable. Typically I have a list of patterns that I can jump back and forth between different sections in a song. With the additional six parts available, I could just push a button to prime up another section of a composition. Plus, being able to press multiple buttons and have sequences play in order gave me the ability to easily create more complex patterns in a live setting. Another feature the TR-8S introduces, that was missing from the TR-8, is that when you save a pattern it also saves the current sound and effect parameters. Something that would have saved me a bit of embarrassment at a show once when I jumped to a pattern on my TR-8 and was greeted with a complex mess of hand claps and low toms instead of what I had saved and expected from that pattern. The moral of that story, obviously, is check all your gear and settings before playing live. In addition to keeping me from looking like I don't know what I'm doing onstage. The TR-8S also makes its new features simple to find and implement when I'm onstage. So now, I'm not fumbling trying to remember how to do something. Nearly everything is a button push, followed by twisting the "Value" knob. Under that Value control is where most of the new goodies are, including the shining star of the TR-8S: the Sample button. With it, I was able to quickly add my own samples to instruments and kits and add them to my patterns. Yes, I added a dog bark. Everyone loves a dog bark in their songs. But I could add voices, actual hits from my drums and really anything I could think of to sample via an SD card. In order to get my random sounds out to the world, I can select from a huge library of sounds which now includes my personal samples via the INST (instrument) button. To change the feel and sound of an entire pattern, the drum machine's Kit button has access to 150, well, kits (a group of sounds packed together). Which again are also a breeze to change and set up for a pattern. Tap on the button and twist the knob until you get the percussion or sound you're looking for. That's it. One thing I'm still not excited about is the Auto-Fill feature. It was introduced on the TR-8 as a way to mix up a pattern the way a drummer adds a fill while playing. You can adjust it to fill every 2, 4, 8, 16 or 32 measures. I've never found the fills to add much to my compositions. You may find them worthy of use and if you do, like everything else, it's easy to implement. That's really the theme of the TR-8S. Everything is simple to find, use and implement. In my time with it both at home and while practicing with my bands, I found it to be one of the easiest to understand electronic instruments I've used. At practice, other band members quickly picked up how to create their own beats and patterns after only a cursory explanation of how the TR-8S worked. Drums and guitars are easy to understand. Electronic instruments, on the other hand, can be mired in complex menus and archaic processes to produce the sounds a musician wants. The TR-8S bucks that with an instrument that old-school drum machine users, and folks new to electric percussion can sit in front of and be able to create complex beats for a band, song or just for fun within a few minutes. 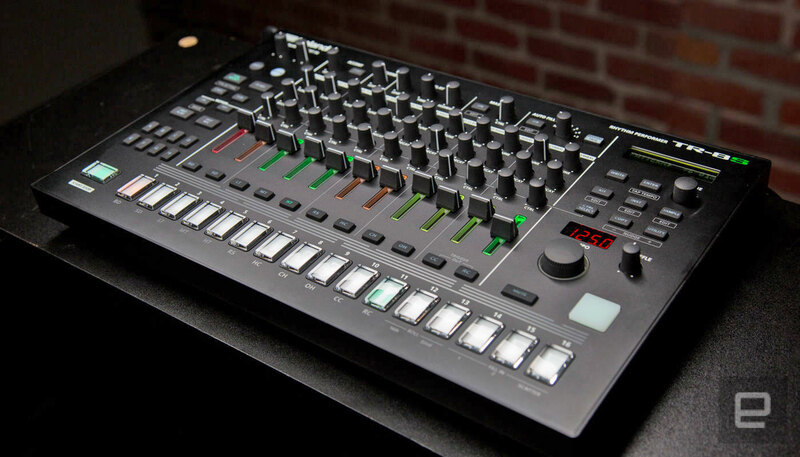 The TR-8S is solidly built (important for gigging), has a ton of features that Roland says its users have been asking for and because the company built it for live performances is robust enough for touring musicians and at-home producers. The $700 price tag seemed steep at first, but after spending a month with the TR-8S, it's clearly worth every dime.